We take lots of long family road trips at our house- because it is the most economical way to travel with eight people! When we visit family in Michigan- it's a 12 hour drive each way, and when we head down to Florida-it's more than 18 hours each way! But of all of the things that I do to prep our car and ourselves for travel- the #1 road trip tip that I follow on EVERY trip we take- is to leave early in the morning! Over the years we have tried many different approaches to handling these long drives with young kids- such as breaking up the journey into two days to minimize time in the car, but we found that all this does is shorten the number of vacation days on each end of the trip, and we don't arrive any more refreshed because we took our time getting there. In fact, it feels as if the trip “took forever”. We also tried leaving at bedtime so the kids could fall asleep as soon as we set out, but since it was also near the adult drivers' bedtimes as well, it meant one of us needed to sleep and the other drive right from the get-go- and I prefer to have both of us awake when driving at night when we could potentially become sleepy at the wheel. The Road Trip Tip That Has Worked Best for Us: Leave Early in The Morning! 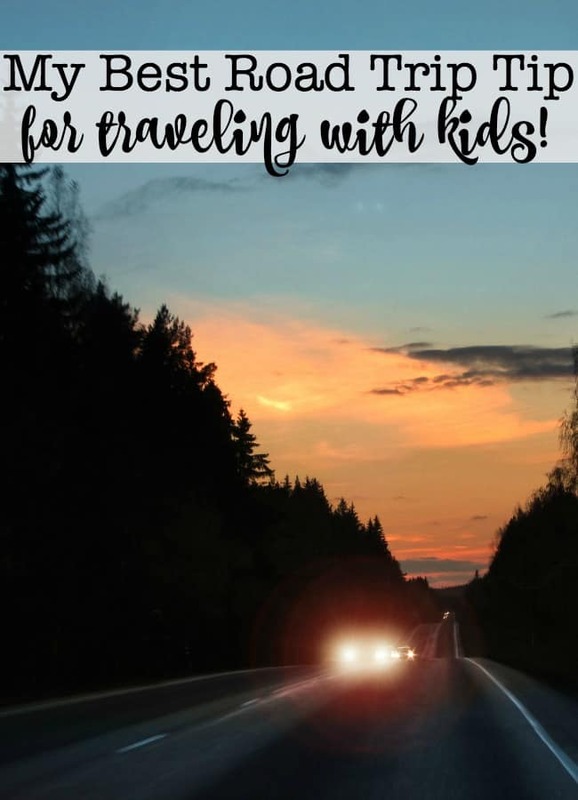 And since we interrupted their sleep schedule coupled with the constant hum of the car engine- we can usually get them to sleep in a few hours later than usual too- which helps us to log those road-trip miles more easily! The adult drivers need to get at least five good hours of restful sleep before getting up for the day. So if you are up late taking care of that last minute packing, or if you try to go to bed at 8 pm but are still wide awake at 10 pm- then move back your alarm time to make sure you get at least 5 hours of sleep before attempting a long stretch of night-time driving. 2. When it's dark- have two wide-awake drivers! It's really tempting to allow one of the adults to go back to sleep when leaving at 3 am so the more rested driver can take over at 6 am, but night driving is tough (unless you are used to being awake at 3:30 am!) and the best way to tackle it is to have someone to chat with so that the driver stays awake and alert. It makes the time fly by faster too! I have to admit- I really look forward to this quiet time with my husband when the kids are all asleep in the car and we have long uninterrupted hours to talk! Once the sun comes up, then take turns napping in the passenger seat while the other person drives. Yes, it is harder to nap during the day, but you'll likely be tired from the middle-of-the-night departure, so you should be able to get in a few more hours of sleep. I also like to pack some sort of a healthy snack to eat (we wait to make a breakfast stop until the kids wake up) so I take along granola bars, pretzel sticks, dried fruit and nuts to munch on. I find that often it's not that I am actually hungry, but more than my body is craving energy, likely because it knows it's really supposed to be sleeping! Singing along to some tunes or listening to an audiobook helps make the nighttime drive more fun, but unless you want the kiddos awake at 4 am singing “Shake It Off,” it's best to keep the speakers turned off in the back of the car and the overall volume turned low. If the kids normally wake up between 6-8 am, try to avoid making pit stops during those hours. Otherwise, the stopping of the car engine will likely cause them to wake up. We'll try to make a rest stop around 5 am and then wait again until after 9 am to stop for breakfast. If we managed to depart at 2 am- that's 6 hours of driving time behind us- before the kids even wake up for the day! Do you find long road trips work best when you leave in the wee hours of the morning? Given if the output of /sbin/ifconfig $i | grep inet | cut -d : -f 2 | cut -d \ -f 1 | grep aaa.bbb.ccc.ddd is blank then I wanted to run two scripts, how I would incorporate that into SIM?Thank you! I have driven a lot over this past summer. I think that it is just as important for the parents to make that stop as it is for the kids once they are awake. I start getting bored and restless while driving if it is much over 2 hours. Kids would be much more restless than parents also, I just have the children watching a movie with their little travel tray and after about two hours then they need to stretch their legs. I love your idea to leave super early! I do the same thing and my friends act like I’m crazy. Also I always pack the car during the day before we leave, this gives everyone time to grab the last minute oops and set up their area. I even try to have blankets and pillows already in the car so we are literally washing them up, going to the bathroom, and jumping in the car. Glad to see I’m not the only one. I find especially as the kids get older, that I have to leave more time for the last minute “Oops” too. Electronic devices, chargers, headphones, etc. But if the 5-minute delay while they run back into the house and grab what they left means a smoother 18 hour trip? No problem!